This exhibition features woodblock prints by Tsukioka Kōgyo (1869–1927), from the private collections of Dr. David Weinberg and Dr. Sheldon Siegel. Each work depicts scenes and characters from Japanese Noh theatre, which combines acting, singing, dancing, and elaborate costuming to tell stories of romance, revenge, adventure, and salvation. Noh theatre is a traditional aristocratic form of Japanese performing arts, is considered more refined than the popular Kabuki theatre. The stage decorations are sparse, drawing the audience’s attention to the actors in their lavish, colorful costumes. 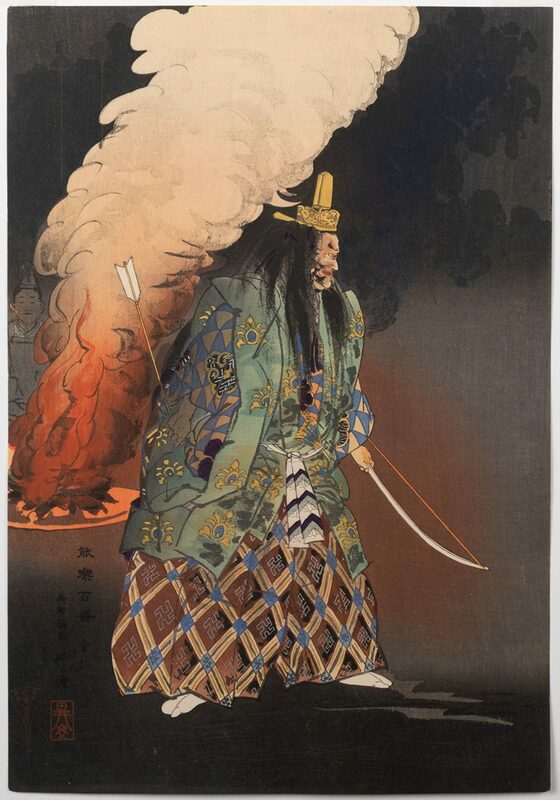 The Drama of Japanese Prints features prints from two major series by Kōgyo: Nōgaku zue (pictures of Noh plays) and Nōgaku hyakuban (One Hundred Noh Plays). After experiencing a performance in 1883, he developed a deep interest in the Noh theatre. Because he wanted to evoke the experience of the plays on paper, his prints feature vibrant, dynamic figures against a minimalistic background.